This module isn't half as good as its cousins, Bree and the Barrow Downs and Erech and the Paths of the Dead; in fact it's the least impressive of the eight adventure modules I'm covering in these retrospectives. By rights it should have been a smash. The marshes outside Mordor are plagued by the uniquely damned: corpse candles, casualty-remains of the Last Alliance, covered with illusions to appear whole, lurking in the water, beckoning awfully; corpse lanterns, larger and more lethal versions of the corpse candles; and swamp stars, the hypnotic lights which lure victims to quicksand pits and other bog-snares. These fascinations, regretfully, are given fleeting coverage in favor of hugely dull sites. Where the towns of Bree and Sarn Erech integrated perfectly with their looming horrors, Caras Gwindor feels contrived, and the Dead Marshes just don't scare us enough to care. I wanted suffocating underwater networks, and got Tol Malbor instead. Not even the stronghold of Thuringwathost is enough to mitigate Dagorlad's shortcomings, much as it tries. Founded in 1592, and commanded by a sorceress who doesn't look a fraction as old as she really is, it lies on the southeast border of the marshes guarding the approach to the Black Gate. No one wants to be taken captive here, to be sure, as the lady is exceedingly cruel, reports directly to Dol Guldur, and has a nasty cleric on hand who takes great pleasure in vivisections. Yet for all this color, the place feels wholly uninspired. As for the bandit hideout in the middle of the marshes, Tol Malbor (the "Isle of the Golden Fist"), its design is as fine as it goes, but again there's the issue of extraneity. And the bandits aren't as juicy as they let on, having authority issues and baggage common to most outlaws, nothing more. Their hideout boasts little beyond an abundance of snare traps, and while their activity of preying on farms and caravans can be worked into a decent enough plot, it's all ultimately a top-heavy exercise in a module that should be focused below the marshes rather than above them. Yet even from above Dagorlad fails. At the very least I was expecting to see the safeways taken by Gollum guiding Frodo and Sam, but they aren't to be found. 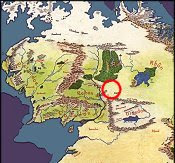 There is the Gondorian fortress of Tir Nindor, built in the 1200s to protect the nearby town of Caras Gwindor. A marsh settlement is also presented, with background of the primitive Marshmen culture. As mentioned, Tol Malbor is the bullseye, reachable only by boat, and Thuringwathost the focal point of evil on the outskirts. Amongst all this ancillary rubbish, is there anything striking to say about Dagorlad? Not really, no. There is, at the end, a burial mound infested with ghouls -- tacked on as an epilogue, of all things, when this sort of thing should have been commanding center stage. Next up: The Teeth of Mordor. 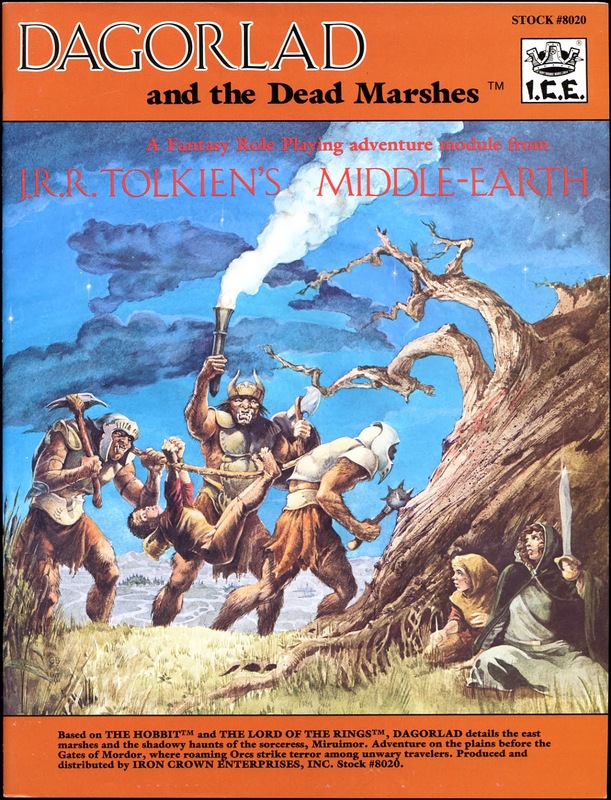 Dagorlad was one of the first MERP products I bought, and I always quited liked, particularly compared compared to the other early MERP campaign modules I had - Umbar and the two Mirkwoods. I was happy to read material that got away from the "canon" and the books and presented something new and unusual that my imagination could work on freely. The tomb, outposts and hidden strongholds are bread-and-butter adventure material for me, since I lean towards wilderness and town adventures. I liked the Dagorlad, Dead Marshes, Nindalf area. The details in the booklet may be thin, but really I was always improvising on the Fenlon maps much more than using the senarios and details in the MERP booklets. Kind of like your comments on transforming Greater Harad into something much more than the original, I put imagination into this area and it grew in my mind. This map may be fairly small, but I saw a lot of adventure in it and the included adventure areas did work well for getting me started on fleshing it out. Gondorian frontiersmen, Bandits, Marshmen, Asdraigs, barrows, Miruimor, undead - it was a much more heavily and diversely populated are than I had imagined before I acquired Dagorlad. The biggest failings seem to be lack of inspired spooky details for the marshes, and they really could have also included a number of eerie shades and phantoms of Dagorlad and the foothills of Mordor. There's a section on the undead, but it's dry and technical - they really need some artwork that features them, and stories that spark the imagination about them. There certainly is missed opportunity there. Durthang is prominent near the center of the map, and it ended up being a major focal point for my imaginings.